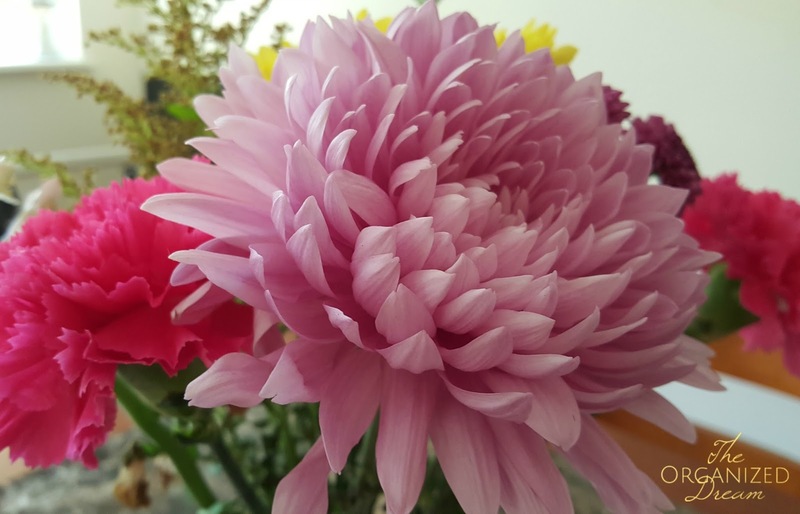 I love flowers and I love to have them in my home. I don't, however, like the fact that they were dying so fast. Then, I learned an easy way to keep them fresh up to 2 weeks (and sometimes longer). I've done this every time I've purchased or received flowers for quite a few years. I often buy my flowers at Aldi because that is where I do my grocery shopping most of the time. 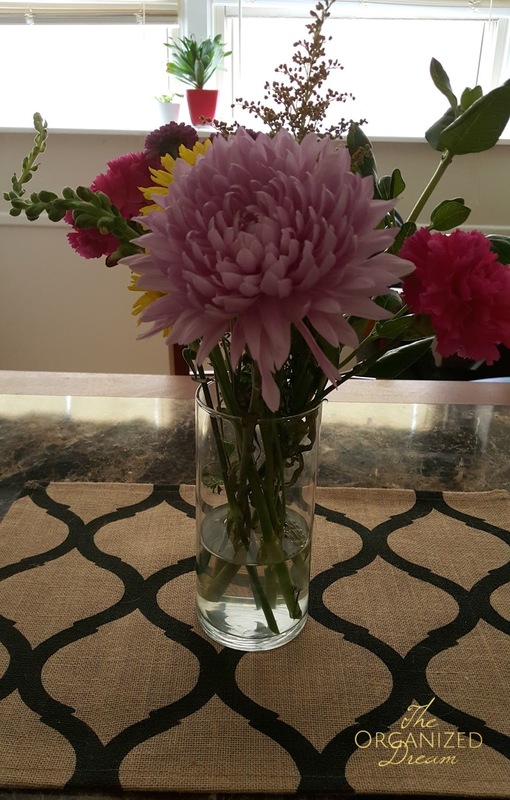 The price is super affordable at just $3.99 a bunch and they often come beautifully assorted. They key in the beginning is to get them home as soon as possible. No plant or flower is going to last long without water. Once the start to wilt, it's hard to bring them back. 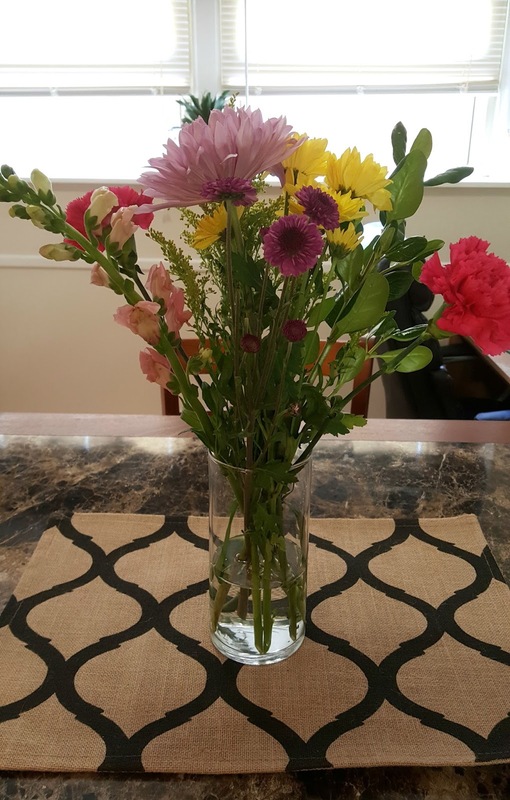 Start by removing the plastic around the flowers and prepare your vase. 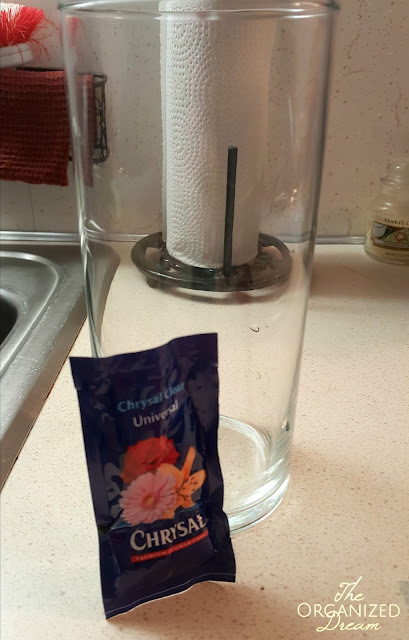 I fill my vase with just enough water so I know each stem will be submerged. After filling the vase, add some of the flower food packet. I add what I feel necessary. Select one flower at a time and remove leaves closest to the end of the stem. This is important! Allowing the leaves to be submerged or sit on top of the water contaminates the water and causes the flowers to die faster. Also remember not to remove too much. After you've removed some of the leaves, place the stem under running water and cut off about an inch or less at an angle. 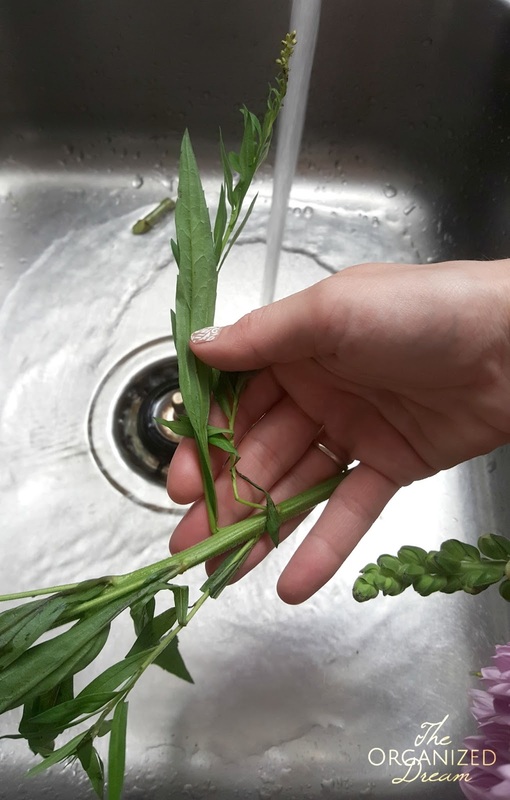 The running water will shoot up the stem as you cut it and will prolong the life. The photo below shows the bunch in the first week. You can see that they are fresh and vibrant. The water will need to be changed every 2-3 days. Follow the steps above every time making sure to trim leaves, cut the stem to make a fresh edge and replacing the water and food. You'll know the water will need to be replaced when it looks similar to what is pictured below. This is week 2 of this bunch and you can see that after a few trimmings and water changes, the stems are shorter and the bunch looks fuller. Who said things don't look better with time? This flower is absolutely gorgeous, isn't it? Thanks for stopping by! 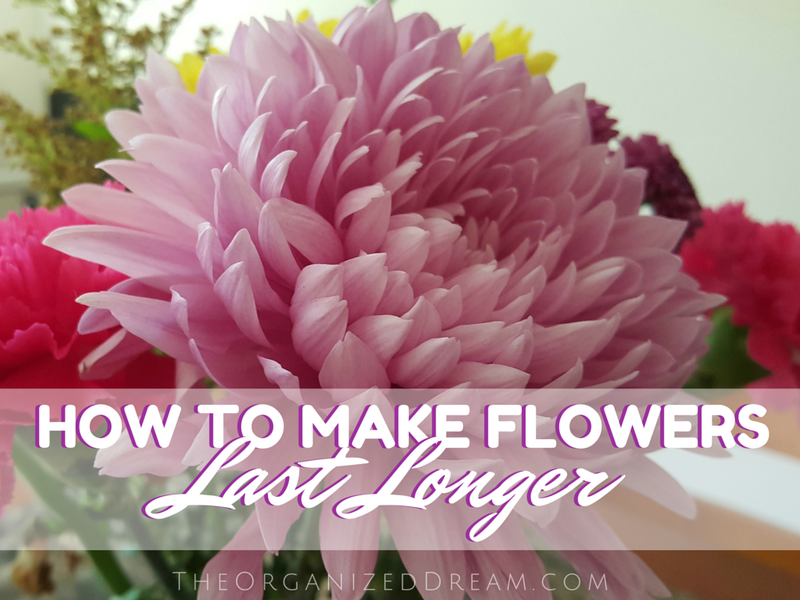 This is definitely a simple way to make your flowers last that can be done in less than 5 minutes! Great tips! 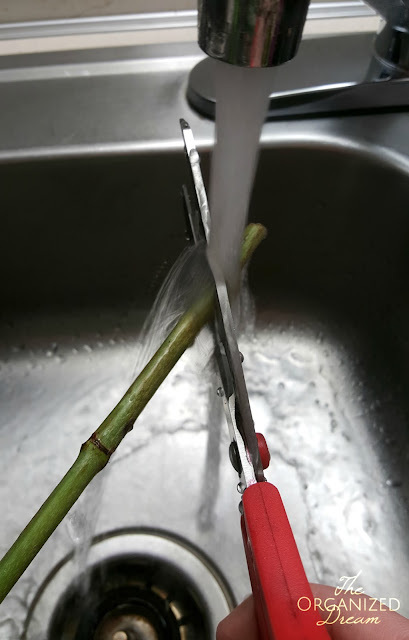 I'd heard about cutting the stems at an angle before but it hadn't occurred to me to do it again whenever I change the water. I'll definitely be putting this into practice. Thank you! Yup! Cutting the end again allows for it to reopen and for the flower to take in water. Great post! I posted something a few weeks ago about how I keep my flowers fresh and I agree with your tips it makes such a difference! I also have a little trick that keeps mine looking really fresh for weeks! Those flowers are beautiful...we have an Aldi, but I have never been...I need to go and pick up some fresh flowers soon. 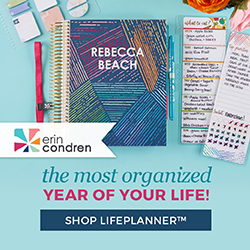 Thanks for sharing, visiting from Merry Monday link up :) Have a great day! Good to know! 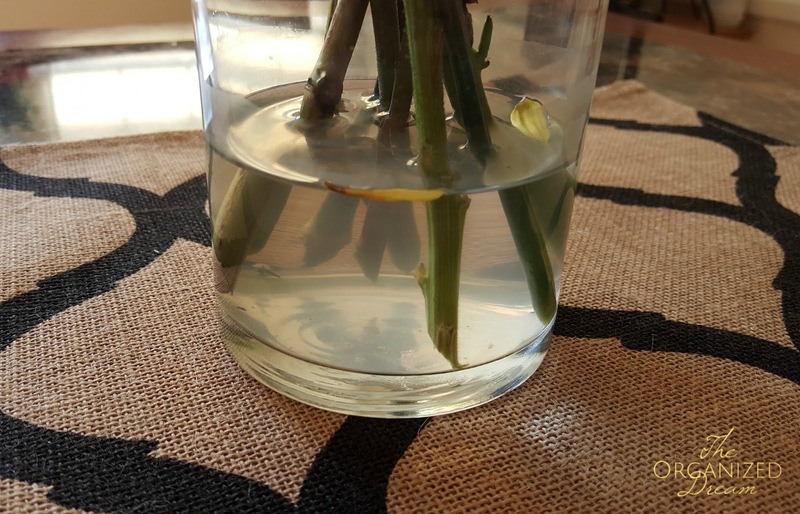 I had no idea you had to remove the leaves that will be submerged in the water... great tips! Great tip! I will be pinning for later! 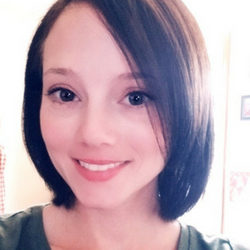 Thank you for linking up to the Merry Monday Link Party! What Great Tips! I did not know that about cutting them under water! I love flowers and since I buy myself flowers this will be nice to make them last longer. Thanks for the great tips. I love flowers but it seemed like such a waste of money because they didn't last. Of course I wasn't doing any of the things that you're recommending. So with this new info I'm ready to buy a beautiful bunch of fresh flowers. Just picked up some Sweet Williams from Aldi so this post is so handy.Thanks for linking up to Pin Worthy Wednesday, I have pinned your post to the Pin Worthy Wednesday Pinterest Board. Hi Kate! Great to see you at Thriving on Thursdays again last week. I'll be looking at ways to keep my flowers fresher longer for my upcoming wedding in September. Thanks so much for sharing. I'll be featuring this post at tomorrow's party. Hope to see you again and have a great week!